Although super-expensive, there are some superb cymbals in this motley collection, suited to jazz but also any music that requires a deft touch and show-stopping colour. With Byzance, Meinl demonstrates just how far the company has come from the Euro-electro B8 cymbals of its early days. 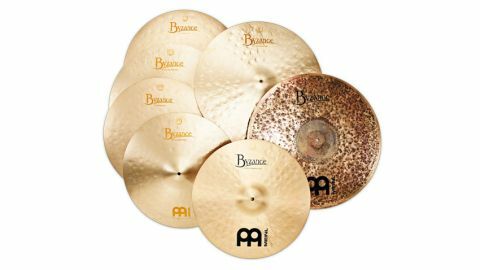 While continuing to develop that movement, Meinl also cleverly in 2000 opened its own facility in Turkey to make traditional jazz-style cymbals. Here Byzance cymbals are individually cast and entirely hand-hammered into shape before sending on to Germany for cosmetic finishing, labelling, packaging and distributing. The results are impressive although the costs are scary. Is any cymbal really worth £562? Byzance cymbals fall into a half-dozen categories and we have here a sample from a massive range. Examining the totally irregular hammer marks on the three Jazz rides it is quite clear they have been hammered by hand. "All three cymbals are lathed top and bottom and finished to a brilliant sheen"
The 22" Jazz Big Apple differs from the 20" and 22" Jazz Medium rides in that a smaller-headed hammer has been used and it also has a smaller bell. All three cymbals are lathed top and bottom and finished to a brilliant sheen. A fourth ride, the 22" Raw Bell ride, is completely different. It has an antique gold appearance with fine lathing beneath a mottled and heavily hammered surface. The contrasting large bell is unlathed and has a powder blue finish. There are also two Vintage crashes - 20" and 22" - which have a muted gold colour, traditional lathing and light hammering, plus a really unusual soft chalky feel to the touch. Other than the final cymbal - an 18" Extra Thin crash - and the Dark Raw Bell ride, which have black signatures, the cymbals have a discreet yellow logo, hardly visible, in keeping with their vintage image. Starting with the 20" and 22" Jazz Medium rides, these are delightful cymbals. While fairly dry with excellent clarity, they afford a good spread with plenty of smoothly mingling overtones. There's that prized 'taaah' feel as you ride with the stick tip, and, unlike so many modern cymbals, as you slide up to the bell the cymbal remains warm - the bell feels connected, not like a separate instrument, but like a natural extension. The bells are sprightly, ringy and tuneful, but still retain some of the warm, buttery taste of the rest of the cymbal. The 22" is considerably deeper in pitch than the 20", but just as lively and versatile. The Big Apple moniker is obviously there to conjure up the legendary jazz clubs of New York, the Gretsch Birdland days of Blakey and Roach through to Elvin and Tony Williams. With its smaller bell and thinner weight it has a deeper fundamental pitch even than the 22" Jazz ride. The spread is vast and dark. Lay into this and you create an ocean of sound that can be overwhelming. The small bell is nonetheless clamorous and vivid, creating a greater contrast with its bigger jump up in pitch than with the Jazz rides. "These large and thin cymbals need judicious handling, but can add unique drama, gravitas and colour to your playing"
Next, the 22" Dark Raw Bell ride, which is wholly different again. This one has a mid-deep body but overlaid with a clattery, glassy and quite sharp stick sound followed by a fair amount of spread again. It's a complex ride sound which has a sort of mini-rumble within it, a harmonic clash which we found off-putting, even unpleasant. Not for us, we're afraid. The bell, though, is a corker - bright and clean. As with the Jazz rides, the two Vintage crashes share characteristics, but the 20" is considerably more dignified than the 22". Blimey, the 22" has more wobble than Cee Lo Green at Alton Towers. The edges billow about like a shirt on a gale-lashed washing line. This one's a real dustbin lid, probably the trashiest crash we have ever encountered and we love it. It's so different, deliciously dusky and truly epic. As with the Big Apple, these large and thin cymbals need judicious handling, but can add unique drama, gravitas and colour to your playing. They are not for the faint-hearted. With its large bell the 18" Traditional Extra Thin Hammered crash is much higher pitched than the other, bigger cymbals reviewed here. The most conventional of the collection, it is a fast-reacting thin crash, making a bright exclamation which quickly drops off to a deeper-pitched medium-sustaining tail.